The Junk Playground is a playspace associated with the Grove Community Garden. 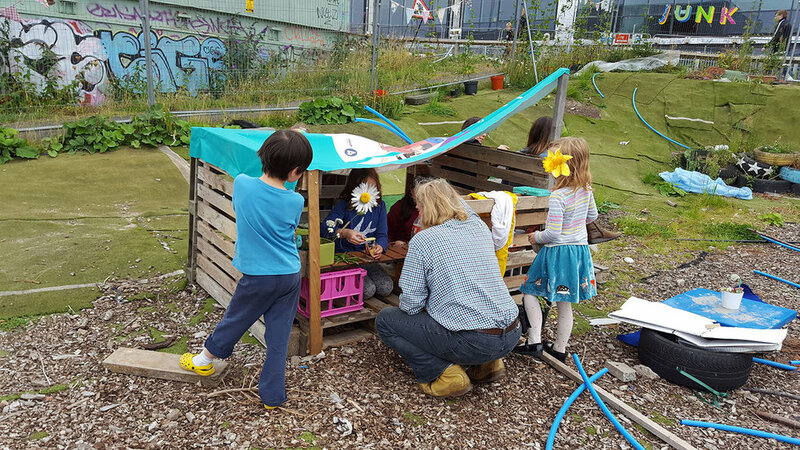 Its use of loose parts, both natural and urban, encourages free, imaginative play whilst parents tend to their garden plots on site. This project was initiated through the Fountainbridge Canalside Initiative with Local Authority funding through the Waste Action Grant. In August 2017, the award-winning Woodland Tribe team brought their self build adventure play experience to the festival city of Edinburgh. The space behind the Pavilion Cafe on the Meadows was seeded with a few structural posts here and there, and a BIG pile of rough sawn timber. Over the course of 5 days,hundreds of children, some as young as 3 years old, used hammers, nails, screws and impact drivers to build the own adventure playground.